The Rundown: John Lewis & Partners has launched the ultimate winter hideaway in collaboration with Sipsmith Gin. 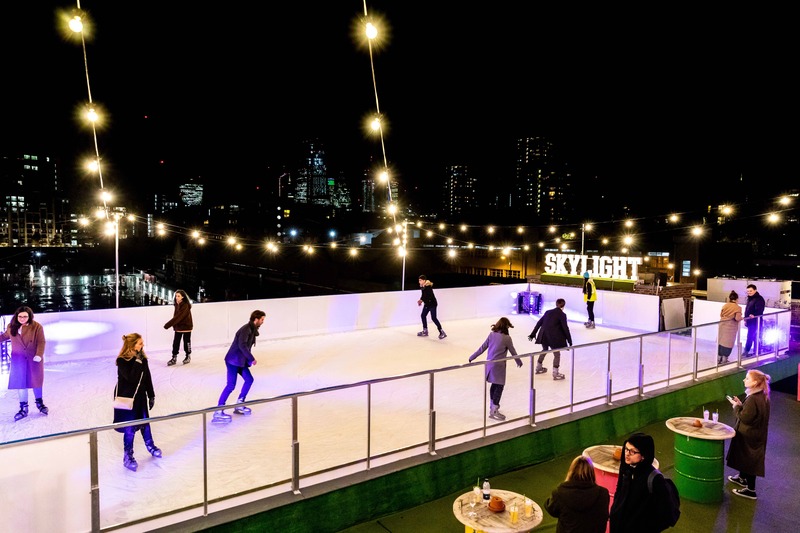 The winter rooftop draws inspiration from the hedonistic frost fairs that took place on the frozen River Thames during the cold months of the 17th Century, when shop owners would set up stalls selling hot gin to hundreds of delighted Londoners. 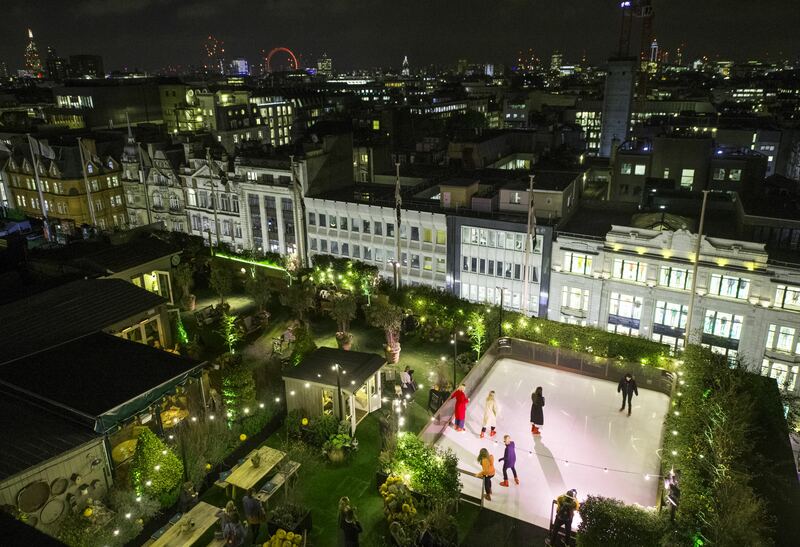 What to Expect: For the first time ever, the rooftop is now home to an ice skating rink, allowing you to practice your pirouettes above the heart of central London. There’s also bookable hot gin hideaways kitted out with throws and faux fur cushion as well as gin cocktails on tap. 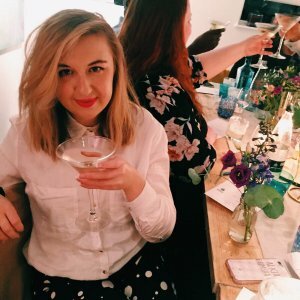 Eat and Drink: The holy trinity: pies, Scotch eggs and spiced gin cocktails. 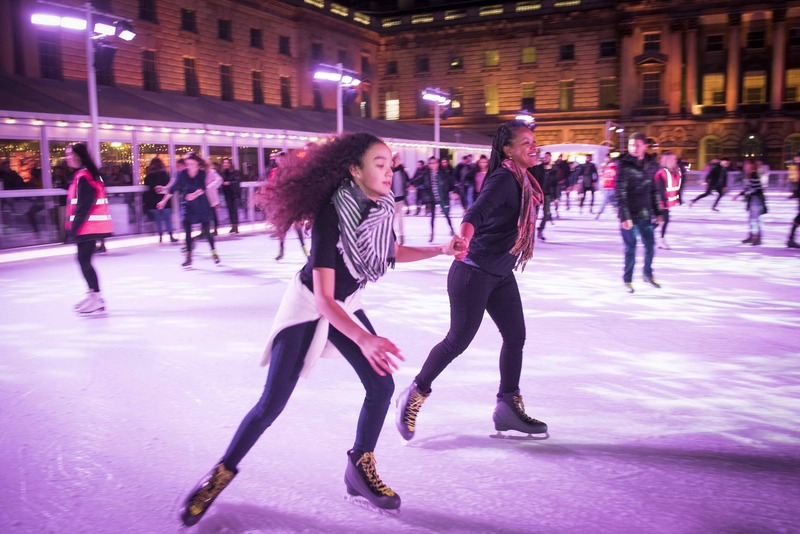 The Rundown: Is it even winter without a trip to Somerset House’s ice skating rink? Absolutely not. 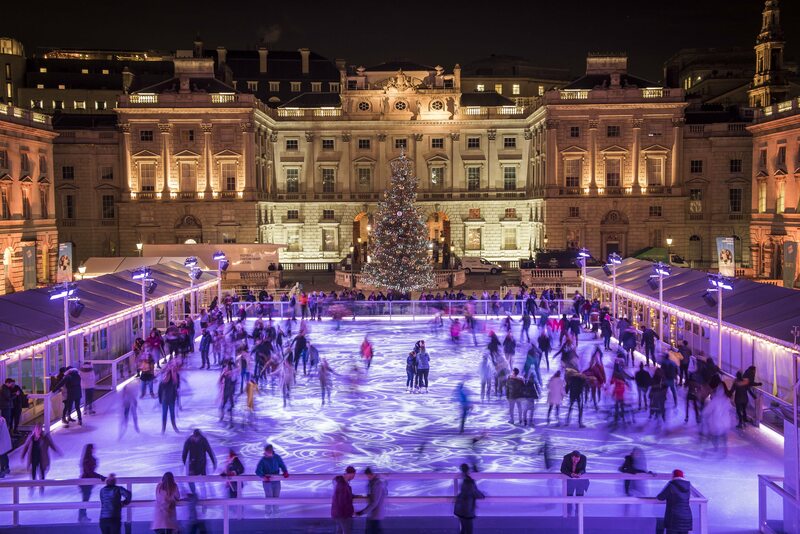 By far one of the most popular festive attractions in the capital, the stunning Edmond J. Safra Fountain courtyard is the backdrop to London’s most beautiful ice rink, where you can skate day or night. What to Expect: Visit in daylight hours, or head in the evening for Skate Lates. Proving an open-air party whatever the weather, this year’s Skate Lates celebrates the best of cutting-edge sound, from hip hop and R&B, with the all-female DJ crew Rock The Belles, to house and grime with some of Rinse FM’s hottest DJs. Eat and Drink: It’s a classy food affair here – wine, baked camembert and brioche champagne, and new for 2018, Champagne and chocolate fondue. 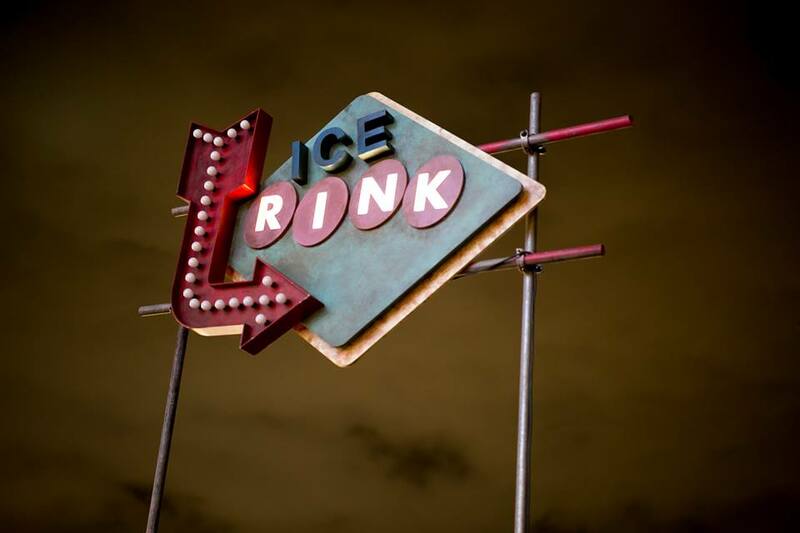 The Rundown: QUEENS Skate Dine Bowl in West London is London’s only ice rink guaranteed to snow this winter, complete with a brand new festive menu from MEATliquor and the city’s first on-ice sing-along sessions (very niche). 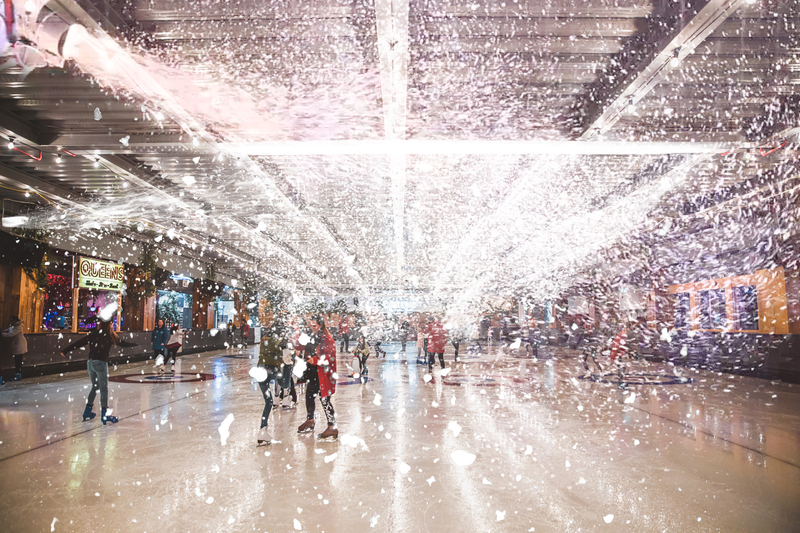 What to Expect: QUEENS have taken inspiration from Frozen, and have decked their super-sized skating hall into a winter-filled paradise, snow and all. 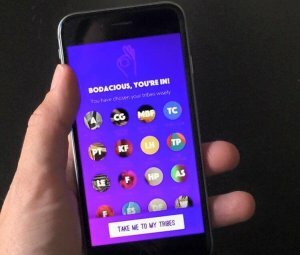 Show off your best Mariah Carey and Wham! renditions whilst skating as QUEENS have introduced sing-a-long sessions on the ice. Taking place every Saturday, expect weekly sing-a-long screenings of the nation’s favourite Christmas classics. Eat and Drink: Christmas bites by MEATliquor. 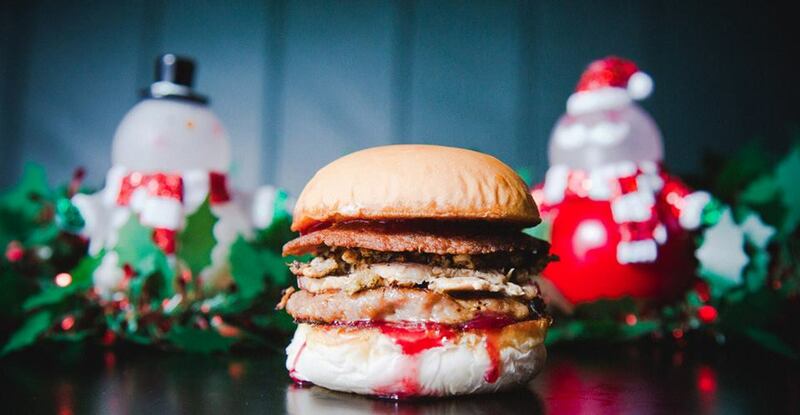 Think stick to your ribs Turkey Cheesesteak, featuring free-range Herons Farm roast turkey bathed in gravy with melted camembert, crispy stuffing crumbles and cranberry sauce. And the Christmas cocktail, XXXmas pudding, a blend of mulled brandy shaken with fresh lemon juice, a hint of sugar cane, a dash of bitters an served in a pudding with a flamed orange twist. The Rundown: London’s alternative festive experience is back. 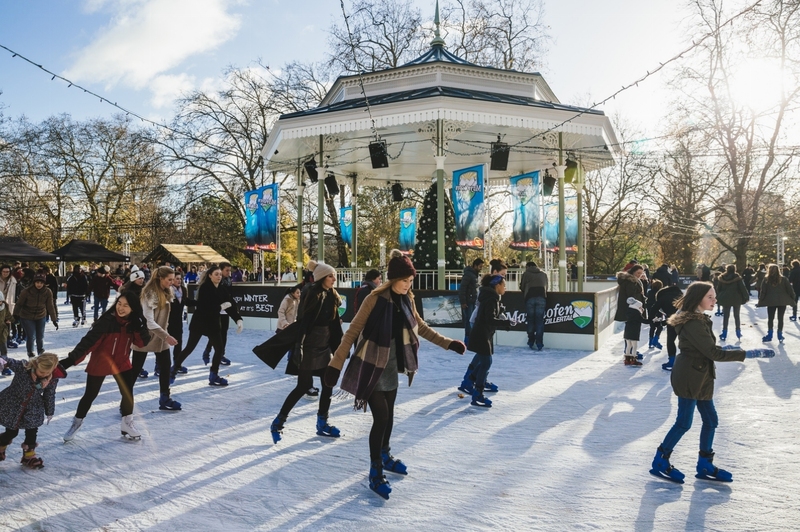 Following the huge success of last year, Winterville has returned to Clapham Common with all the festive regulars: Street Feast, Backyard Cinema, the Ice Rink, Twisted Wheels Roller Disco, Plonk Golf, the Fairground, Spiegeltent and pop-up pub Bar Humbug. What to Expect: Winterville’s open air ice rink is 600m2 and constructed from real ice. 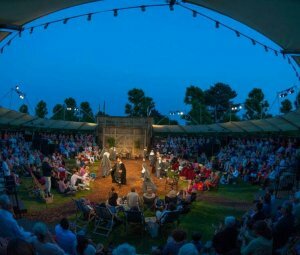 It’s open Tues to Sun and suitable for all abilities. If gliding across Clapham Common doesn’t appeal, then stay warm and hydrated in the neighbouring cafe, where you can check out all the action in comfort. Eat and Drink: Street Feast has the food covered with some of London’s best street food traders whipping up specials with a festive twist: Up In My Grill’s fondue steak sandwiches with juicy Bavette steak, confit onion, cheese fondue, garlic butter and bone marrow gravy, INK’s spiced Christmas fish nuggets with sweet chilli and ginger dip, and Raclette Brothers’ plates of molten Raclette cheese with roasted potatoes, pickles and pancetta. The Rundown: The ice rink at the Natural History Museum is one of the most magical places to be this winter. The Café Bar has a bird’s-eye view of the rink, and is open daily until the ice rink closes. Even if you’re not skating, you can swing by for a hot choccy and a wedge of cake. 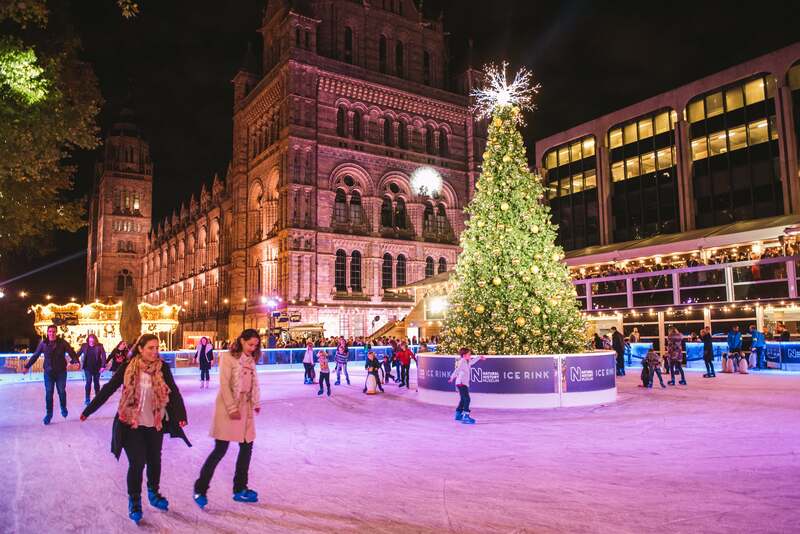 What to Expect: Against the iconic backdrop of Alfred Waterhouse’s spectacular building, this huge 1,000 square metre ice rink, with a sparkling 30ft Christmas tree adorned with twinkling fairy lights (76,000 of them, no less) as its centre piece, makes for a pretty special skating experience. Eat and Drink: Head to nearby Scoff & Banter for a post ice skating afternoon tea. Think cinnamon spiced carrot cake and mandarin dark chocolate sponge cake, accompanied by an array of freshly made sandwiches, home-baked scones, tea and coffee. 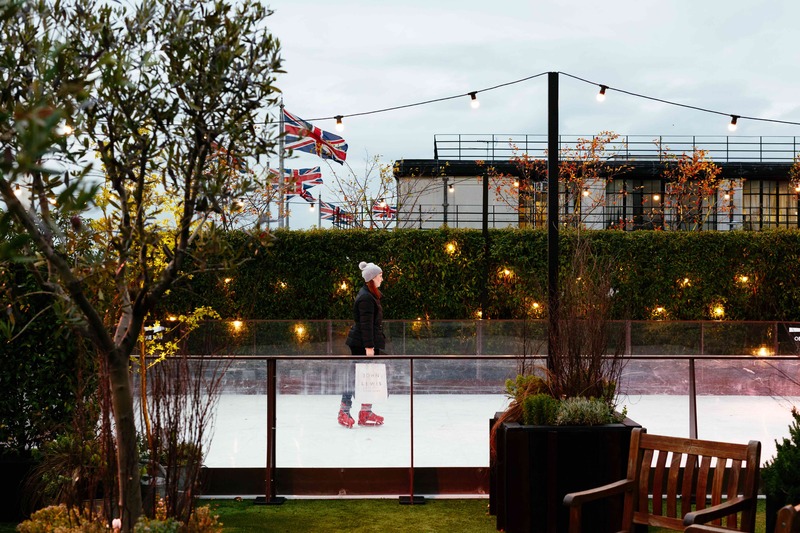 The Rundown: Themed around an urban après skate bar, Skylight, the three-story east London venue, features a rooftop ice rink, seasonal cocktails, ice hockey shooting, DJs, brand new igloos and huts, and some of the best views in the city. 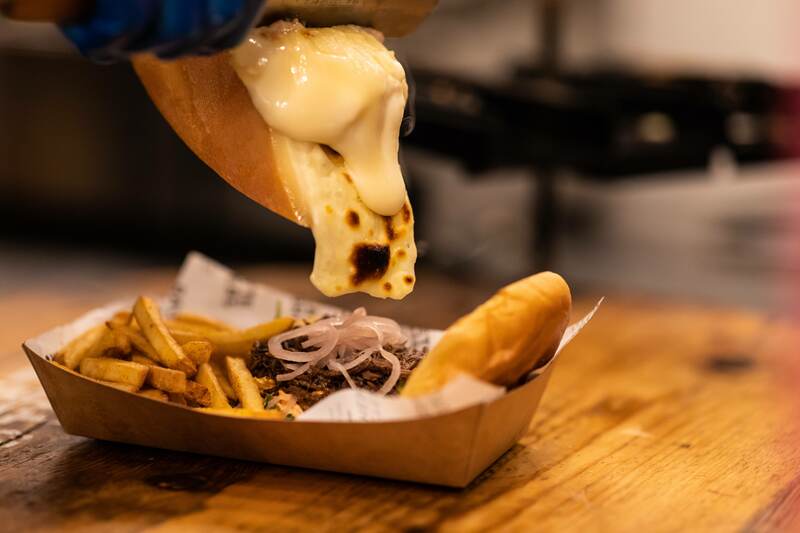 Eat and Drink: Street food stalls are available on the lower level, from authentic Greek street food vendors YIRO and Skylights newest foodie addition, Raclette Brothers, who serve up indulgent Alpine street food and copious amounts of melted cheese. 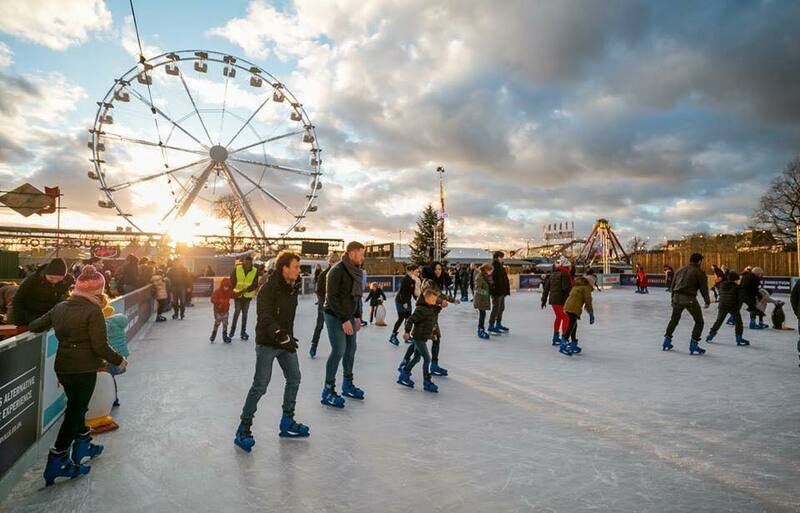 What to Expect: The UK’s biggest open-air ice rink is back for 2018… but this year, it’s supersized. 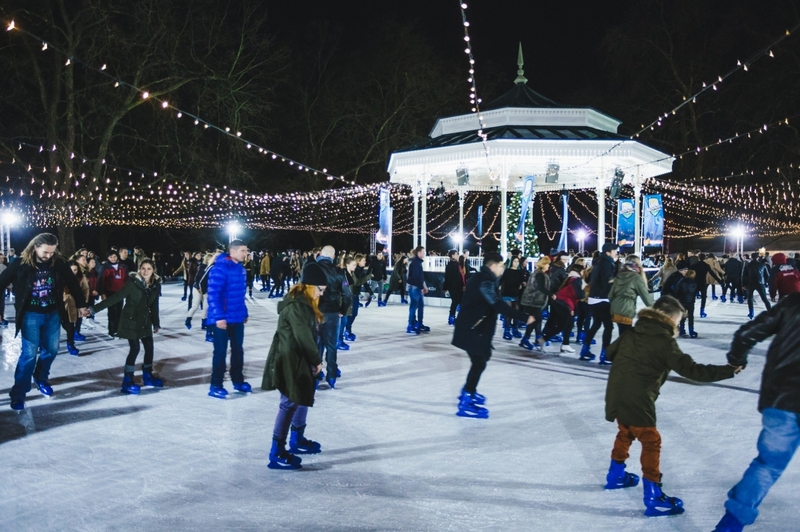 Over 1,765m2 and located within the leafy, tranquil setting of the capital’s most iconic park, the spectacular rink is laced with thousands of twinkling fairy lights. 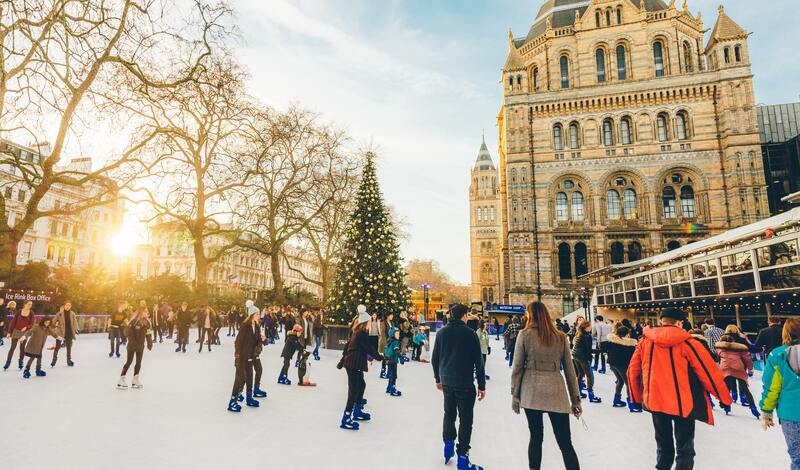 Providing festive fun for families, friends, couples and colleagues, the ice skating sessions take place on the hour, every hour and last approximately 50 minutes. 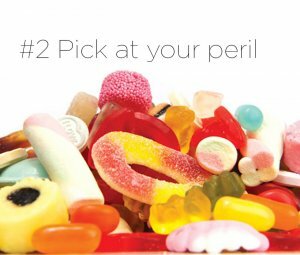 Eat and Drink: Burgers, hotdogs, candy floss, beer, cider, mulled wine and doughnuts. Fairground food, basically.